They’ve launched a new cloud storage service called Copy, which is similar to existing programs from Dropbox, Box, Google and other storage services which I’ve talked about here. Copy is marketing itself as more secure and protected than other cloud services, since they can leverage the security background and experience of Barracuda. Given the recent issues with Dropbox and larger issues like Heartbleed, it’s an interesting marketing angle. Copy gives you 15GB of free storage to start with, which is well above the 2GB you get with Dropbox. The service itself runs via the web, Mac app, Windows app, iOS, Android and Linux. 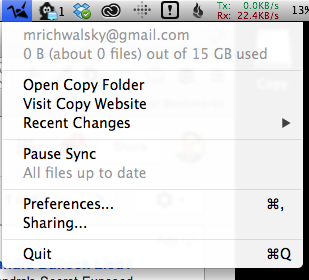 On my Mac, Copy works just like Dropbox with a folder I can install and drag files to and from. Syncing happens quickly and the files and their transit are encrypted using AES256. Like other services, you can right-click on an item and get sharing and public links for items, which is handy. We’re always sharing files, screenshots and more in the office using a myriad of different services. I didn’t see a feature like Dropbox’s “automatically be the place for screenshots and put the public link in your clipboard,” it’s not that big a deal to find the file and right-click to get the link. One feature I think is interesting is if you are sharing a large file with multiple people, you can split the size “hit” with each user. If you’re sharing a 1GB file with someone on Dropbox, you both download it and are charged with 1GB worth of space. Copy lets you split that storage hit so the 1GB file you are sharing with 4 people only counts as 250MB towards each person’s quota. So where does Copy make its money? They’re banking again on the Barracuda name and the hope that IT organizations will see the security experience Barracuda has and let it be an approved cloud sharing service. Teams can be as small as 5 people (using the free accounts) all the way up to 30 users for $2,697 per year, total. As of last fall’s prices, those same 30 users would cost $3,920 at Dropbox and $5,400 at Box. You can sign up for Copy and try it out using this link and you’ll get an additional 5GB of storage once you install their app, and I’ll get some extra storage as well.